Justice Minister Judith Collins has appointed Dame Susan Devoy as Race Relations Commissioner. She replaces Joris de Bres, who has served two five-year terms and is very well-regarded in Māoridom (at least) because (in part) he understands the importance of his own Dutch whakapapa, and the complexity of his place as an immigrant in Aotearoa. As Bryce Edwards and Morgan Godfery have noted, he has also shown an unusual willingness to comment on issues related to his mandate of opposing racism. No doubt this fact has informed Collins’ decision to appoint someone less feisty. Dame Susan has little or no high-level experience in the field, and I suppose the thinking is that she brings a clean slate to the role or, to put it another way, her thinking and the degree of her engegement with the issues will be more easily influenced by the prevailing governmental culture. But Dame Susan is not a blank slate. A week ahead of Paul Holmes’ now-infamous Waitangi Day a complete waste column, she wrote one of her own that, although it employed language more befitting a Dame, nevertheless expressed similar sentiments. One year ago our new Race Relations Commissioner wished that instead of Waitangi Day we could have “a day that we don’t feel ashamed to be a New Zealander” and pined after a holiday like that celebrated in Australia, where — a few recent and grudging obeisances aside — 50,000 years of history and the brutal facts of the settlement of that land are blithely ignored in a jingoistic celebration of Ocker Pride. This is a terrible appointment. Anyone who thinks Aotearoa’s race-relations culture isn’t complicated is by definition not equipped for the job of guiding and guarding it. Not only is our new Race Relations Commissioner ashamed of our national day, but as far as she’s concerned it’s just another ism — revealing how little she must know about disability, employment or gender issues into the bargain. So as far as that goes, she looks like the perfect post-ideological, post-identity selection for such a job: a common-sense managerialist who, to the limited extent that she understands the issues in play, finds them distasteful. What a good opportunity for Labour! The National government, at a time when racial and cultural tensions are a major issue, clearly doesn’t value race relations sufficiently to put anyone competent in the job. But the Labour party has selection problems of its own: an Ethnic Affairs spokesperson who is a former race relations commissioner (Rajen Prasad) so far down the list that he doesn’t get a ranking; and a Māori Affairs spokesperson — and former minister — Parekura Horomia, also unranked. Labour is perilously short on brown faces, with none in the top five and one — Shane Jones — in the top 10, and him only recently returned from purgatory. Morgan Jack McDonald has some advice on this topic. The hard truth is that Labour isn’t in a position to criticise the government on race relations issues. This is due to their internal failures of strategy, not due to exigencies forced upon them. For all that the appointment of Dame Susan Devoy to Race Relations Commissioner is terrible, the Key government has done a lot more than expected in other areas of race relations, particularly with regard to progressing Treaty settlements. That gives them cover. They’ve gotten away with worse than this appointment, and they’ll keep getting away with it as long as the major party of opposition lets them. Blog Link: Australia as a different type of BRIC. In spite of some serious dysfunctionalities in its party politics and potential problems with its economic growth model (heavily dependent on mineral exports), Australia is well on its way to becoming a regional great power. In this regard it shares macro-characteristics with three of the four “BRICs:” Brazil, India and Russia (the PRC has surpassed regional great power status and is no longer, in my opinion, appropriately categorized with the others). Although Australians may prefer not be grouped with the others for a variety of reasons, I take the notion of “rising middle power” as the starting point for a comparative analysis of Australia as a different type of BRIC. Having neglected my bloggerly duties these past six weeks (in fact, I’ve been neglecting all my duties which aren’t strictly in service of looking after my family and keeping my job), I had resolved to write something about one of the many momentous events which have taken place recently. There are many to choose from. Some topics (Pike River; Wikileaks; Foreshore and Seabed for instance) are no longer immediate; others (the re-emergence of Winston Peters, commencement of the NZ general election campaign and its forerunner the Botany by-election) are not yet sufficiently well-formed for me to quite know what to say about them yet. Yet others (notably the shooting of Gabrielle Giffords, Wikileaks and the Urewera Terra trials) have been more ably dealt with by Pablo and/or so many others, such that anything I could say would be redundant. There’s already enough peoples’ two cents rattling around in the hollow urn of internet discussion. In the context of these events other things I was meaning to write about (such as the manvertising topic Pablo discussed before the break) seem a bit trivial. Add to all of this, today there is really only one story; that an area twice the size of Texas — the canonical measure of a really big thing — is underwater in Queensland; including much of Brisbane. The coverage put out by the Australian media, and in particular the ABC, is first-rate, and the best I can do is commend it to your attention. There is one point, however, that I don’t think has been made strongly enough: and that’s that events such as these are a consequence of climate change. While it is fashionable for climate change deniers to mock those pointing to the increasing frequency and severity of snowstorms, cold snaps, hurricanes and torrential rainfall events as evidence for ‘global warming’; implying that climate science proponents try to take everything as evidence of ‘global warming’, the fact is that the term ‘global warming’ was retired and replaced with ‘climate change’ because the thesis isn’t just that the planet will get warmer. That’s part of it, but the events — snowfall and what not — being pointed to are not climate; they are weather. The relationship between climate and weather is a lot like the relationship between mathematics and arithmetic — indistinguishable if you don’t understand them, but fundamentally of a different order. Weather, like arithmetic, is by and large small, trivial, unarguable stuff — stuff which is more or less self-evident. It rained this much last week; 2+2=4 — whereas climate, and mathematics, are bigger, more open-ended and by definition less quantifiable. Mistaking ‘weather’ for ‘climate’ is an immensely useful rhetorical device, and one which I believe has not been sufficiently well guarded-against by those whose task it is to argue the climate change case. But even though it may not have been made clear to the degree necessary for broad public and political comprehension, this distinction is well understood by those working in the field and anyone who cares to acquaint themselves even scarcely with the material. And fundamentally the take-away is this: climate change caused by the increased quantity of greenhouse gases in the atmosphere, to the extent that it takes place, will have unpredictable flow-on effects such as increased frequency and severity of severe weather events, and not just heat waves and droughts such as ‘warming’ would suggest. The XKCD comic above (of which some years ago, my wife bought me the t-shirt) shows the Cosmic Microwave Background radiation spectrum. This has nothing much to do with climate change, but it is a famous proof of the scientific method: a near-perfect agreement between theory and actuality which is pretty fundamental to our understanding of a bunch of stuff. 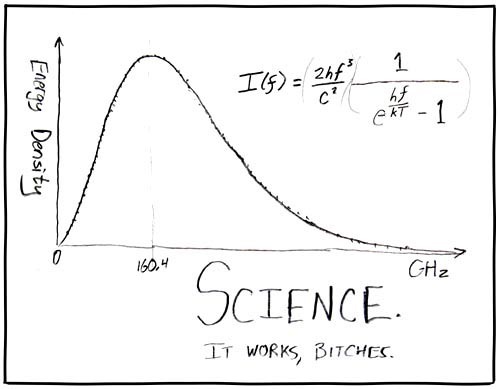 Science’s only defence; the only thing which gives it any importance or makes it any use at all, is that it works. When properly applied, it predicts actual events. The Queensland floods, as well as other such events, are happening as predicted, and anyone who tells you otherwise is either ignorant, or having you on, or both. In Andrew Bolt‘s case, it’s both. Queenslanders — and others similarly impacted by such events — need neither. This ad for the Aussie Greens, made by Republic of Everyone for the ABC’s election campaign showThe Gruen Nation, is political-symbolic advertising done right. George Darroch tipped me off to it and describes it as “a political-emotional cluster bomb”, which is about right. It frames up some current issues in an explicitly normative, socially aspirational fashion by posing a set of questions which essentially answer themselves. It presents these issues — particularly gay marriage and boat people — in a way which permits cross-ideological consensus, opening the door to support from Coalition-supporting classical liberals. It’s so good the party itself wants to run the ad on TV, and I would too. If the Climate Science Coalition wants science decided by the courts, rather than by scientists, then they’re welcome to open that door. It speaks volumes about their relationship to science; as a chap on Morning Report said this morning, neither judges nor lawyers can make this determination; if they have scientific experts who can legitimately challenge the record, let’s see them do so. But I have one proviso: They must be bound by the court’s findings. If the court rules, as I expect them to do, that there’s nothing wrong with the NIWA record, then I expect the CSC to take their lumps with good grace. But I expect instead to hear shrill shrieks about activist judges and political-ideological conspiracies. By the same token, of course, if the courts rule against NIWA then I expect the same, and will want to hear some answers from them. Science welcomes scrutiny. KiwiRail continues to fail horribly, this time citing ‘unexpected complications’. The only thing ‘unexpected’, as far as I can tell, is that they’re advising commuiters of the problems in advance now, rather than days after the fact. Just another reason I’m thrilled to be working from home at the moment.